Oldendorf Medical Services is a privately owned, primary care office. Opened on June 1, 2009, OMS was created out of a desire by Dr. Oldendorf to best address the health care needs of his patients. By being independent, Dr. Oldendorf is able to bring innovative and progressive programs into the office and is also able to refer patients as necessary without being required to send them to a particlar group or specialist. Each one of our patients at OMS is very important to us and we strive to provide superior health care as well as excellent service! 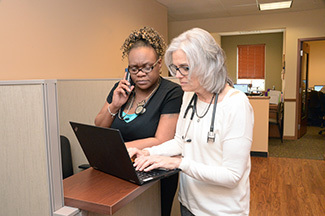 OMS is is one of the few primary care offices in the country to be included in the national Comprehensive Primary Care Initiative. We are very proud to be part of this program. This medical home model encourages a continuous relationship with a personal physician, emphasizes coordinating care between health care providers and facilitates including patients in decision making about their health. At OMS, we believe that creating a caring and respectful relationship with our patients is a vital part of our role in our patients’ health care. By offering both comprehensive medical services along with personal attention we hope to serve as your primary health care provider for many years to come.